Buck or Run: Which is Your Horse More Likely to Do? When your horse panics, is he more likely to buck or run? Can you tell? If so, you can better prepare yourself to deal with it. What about if you have a new horse; how can you determine whether he is more likely to buck or run …before it happens? I recently attended a veterinary conference where a behaviorist discussed how horses can be classified into the two categories of buckers and runners, depending on their ancestry. Horses with a tendency to buck descended from lines of horses living in mountainous country who were pursued by predators that leapt onto them from above, such as mountain lions. This line of horses developed bucking as a defense mechanism against these kinds of predators, since bucking is more likely to dislodge a clinging mountain lion than running. Horses with a tendency to run, on the other hand, descended from lines of horses living in more open environments, such as the high desert. Horses from this line were pursued by fast predators that chased them over long distances and fairly flat terrain. As bucking would not have proved useful against these predators, this line of horses used running as their main defense mechanism. So that's the history lesson on buckers and runners. Now the question is how this information is relevant to you and your horses. After all, you probably can't trace the lineage of every horse you own way back to their ancient heritage. I've got a simpler way: use the Five-Element horse personality system. Knowing your horse's Five-Element horse personality type can prepare you for the times when your horse "loses it" and panics. Of course, knowing your horse's personality type also means that you will know how to avoid putting him under stress, so you can avoid all that bucking and running. For instance, throw too much information too fast at a Metal horse, and be prepared for some bucking. Metal horses never forget what they learn, but they learn by digesting small chunks of information presented in an orderly fashion. When their brain goes into overload, their front feet get stuck and their hind end gets busy. The end result? Bucking! Earth horses tend to buck either when they feel too lazy to work, or when they are asked to do a task they feel they cannot do. Any task out of the ordinary may also be cause for bucking, as Earth horses love routine. Ask an out of shape Earth horse to work hard and fast, and you will see some bucking action. Wood horses buck because it's fun and causes trouble. Being born trouble-makers who are easily bored, Wood horses are prone to bucking when asked to do something they don't feel like doing or when life is just too boring. Don't be surprised if a Wood jumper horse spooks and bucks at an imaginary boogey man at the start of the show jumping round "just for kicks." In the other category, the runners, you have the Fire and Water horses. A Fire horse tends to bolt when being asked to do something he find distasteful or when over-faced with a task he feel he cannot physically do. For example, attempting to ride a fastidious Fire horse into a herd of dirty smelly cows may be justification enough for running. Water horses tend to run out of fear or, more likely, sheer terror. Water horses like learning new tasks, but they prefer to learn them in a known, safe environment. Presenting a Water horse with too much information in a new environment will definitely provoke some running. For instance, don't try to take a Water horse over a trail course at a horse show if you haven't schooled all of the obstacles at home, where he feels safe. Even one new obstacle in the trail course, combined with the other noise and distraction at a show, may be enough to cause a Water horse to bolt. I hope this helps you figure out whether your horse is more likely to buck or run when under stress, and to be prepared! Learn more about your horse's Five-Element personality type by accessing the resources below. Do you want to find out if your horse is a bucker or a runner? Here are three steps you can take to discover and learn more about your horse’s Five-Element personality type. Visit the Horse Harmony Test and take the test. You can test your horse and yourself. If you don't know how to answer a specific question on the test, leave it blank. Once you finish answering the question on the test, you'll get the assessment right away. The test has just been updated so you might want to take the test, even if you have taken it in the past. To get an overview of your horse's personality type, visit the Horse Harmony site and check out the Resources. You'll get a quick overview of your horse's type, plus access to some additional resources. 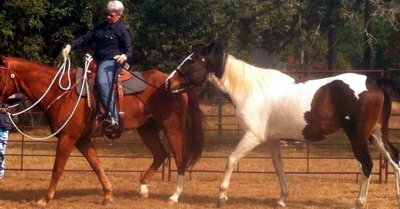 The overview will get you started, but once you discover your horse's personality type there will be so much more you will want to learn. You'll want to know the best feeding program, training regimen, career, and management program for your horse, plus much more. Get it all in the Horse Harmony book and Five Element/Six Temperament ebooks.